The potential of engineered nanomaterials (NM) to enhance performance in a variety of technology sectors has been a major driver for industrial growth and innovation over the last decade. Carbon-based NMs, such as carbon nanotubes (CNTs) and graphene, are particularly attractive for some industrial uses due to their stability and unique geometries and physicochemical properties . Multi-walled carbon nanotubes (MWCNTs) are among the most abundantly produced carbon NMs . While MWCNTs can offer real performance advantages in large-scale applications such as electronic devices and conductive composites, the associated occupational, consumer, and environmental exposures have raised concern regarding potential health risks [1, 3]. The high aspect ratio and fibrous characteristics of MWCNTs, similar to that of asbestos fibers, have been implicated in lung toxicity elicited following exposure in rodent models [4–7]. Several studies have previously documented MWCNT-induced pulmonary toxicity in vivo and in vitro, though the direct implications of these adverse effects for human health are currently under investigation. 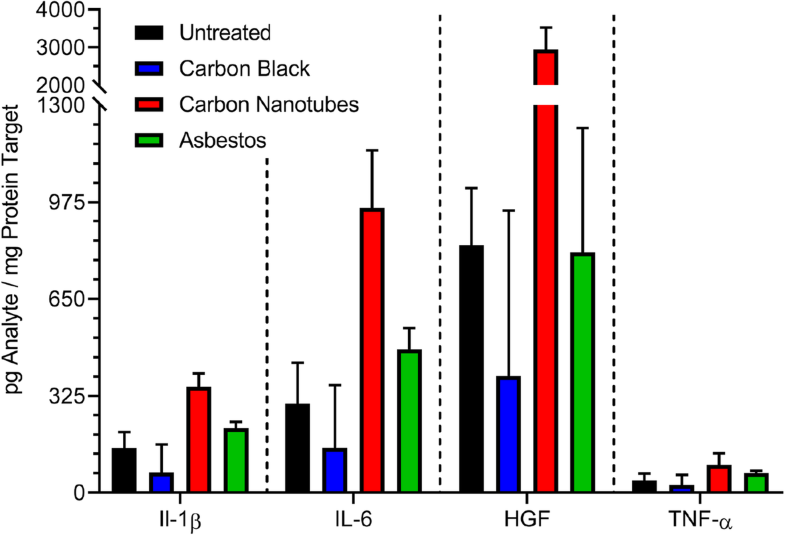 Carbon nanotubes have been reported to modulate inflammatory responses and to induce oxidative stress, development of granulomas, and pulmonary fibrosis in rodent lungs [8–13]. Animals exposed to MWCNTs by oropharyngeal aspiration, intratracheal instillation, or inhalation demonstrated acute inflammation with pulmonary infiltration of polymorphonuclear (PMN) leukocytes and other white blood cells into alveolar spaces, and elevated levels of pro-inflammatory cytokines such as IL-1β and IL-6 in bronchoalveolar lavage fluid (BALF) [5, 14, 15]. Furthermore, inflammatory responses were often sustained, contributing to chronic inflammation and the development of subsequent lung pathologies [9, 12, 16–18]. Histopathological and biochemical data from previous studies have shown abnormal deposition of collagen, formation of granulomas, and increased expression of pro-fibrotic factors such as TGF-β1, PDGF-A, osteopontin, and collagen in lung tissue from exposed animals [16–19]. Specific pathways including IL-1β mediated inflammasome activation and TGF-β/SMAD signaling have been implicated in the development of pulmonary fibrosis [20–22]. 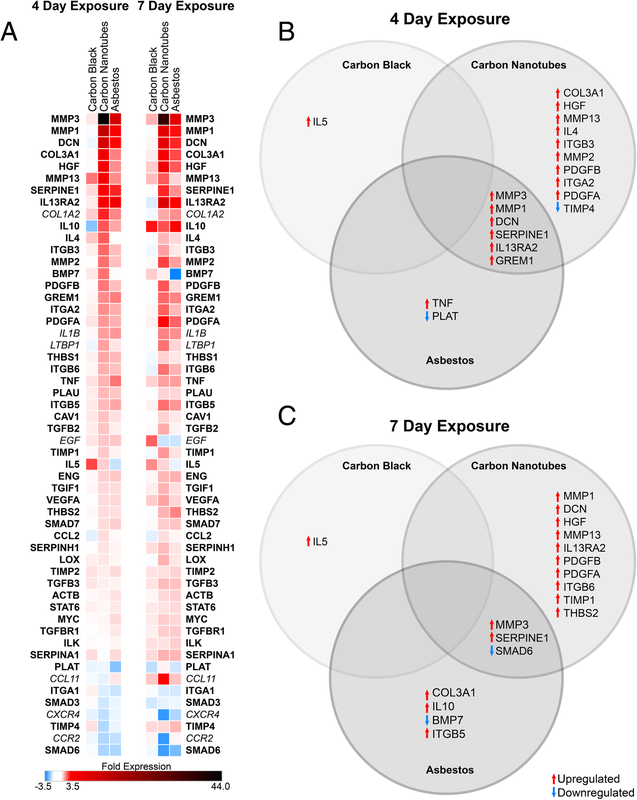 Microarray analysis of mRNA and miRNA expression following exposure to MWCNTs in mice identified several regulatory networks involved in sustaining a progressive fibrotic phenotype following an initial inflammatory response, including pathways for leukocyte migration, extracellular matrix remodeling, chronic inflammation, and other signaling pathways involved in development of fibrosis . The potential adverse human health impacts of nanomaterials emphasize the need for improved and more efficient nanotoxicology testing platforms relevant to human physiology to enable design and selection of safer nanomaterials in the future . The current standard for nanotoxicology testing utilizes time-intensive in vivo models, severely limiting the number of nanomaterials that can be evaluated for safety, and resulting in a growing catalog of untested nanoparticles . Although two-dimensional (2D) monolayer in vitro models are time and cost efficient, they lack the complexity of intact physiological systems and may not provide results that can be correlated with chronic in vivo responses [38–40]. Existing in vitro lung models have been focused on the use of synthetic scaffold-based systems or transwell models designed to mimic the pulmonary air-liquid-interface (ALI) . These conventional models do not fully recapitulate the complexity of tissue morphology and organization, cell-cell contacts, or chronic responses that require longevity and functionality beyond an acute time frame . Three-dimensional (3D) in vitro platforms provide a unique alternative to bridge the gap between traditional 2D in vitro and in vivo models, allowing for better replication of in vivo tissue function through 3D cell-cell and cell-matrix interactions and prolonged viability [40, 42]. Inhaled particles and fibers are engulfed by macrophages and trigger an acute inflammatory response leading to recruitment of additional inflammatory cells, sustained inflammation and injury, and chronic pulmonary fibrosis [27, 31, 47, 48]. The initial step that triggers this cascade of pathological reactions is hypothesized to be lysosomal membrane permeabilization following phagocytosis resulting in intracellular release of cathepsin B and secretion of mature IL-1ß, a potent proinflammatory cytokine [49–51]. This initial triggering step leading to NLRP3 inflammasome activation  has been widely assessed using in vitro assays based on the human monomyelocytic leukemia cell line, THP-1 [44, 49, 53]. The THP-1 cell line is representative of monocytes that grow in suspension; in response to PMA exposure, these cells differentiate into macrophage-like cells capable of phagocytosis; a second priming step using LPS is used to initiate transcription of pro-IL-1ß based on harmonized protocols established by the NIEHS Nano GO Consortium . 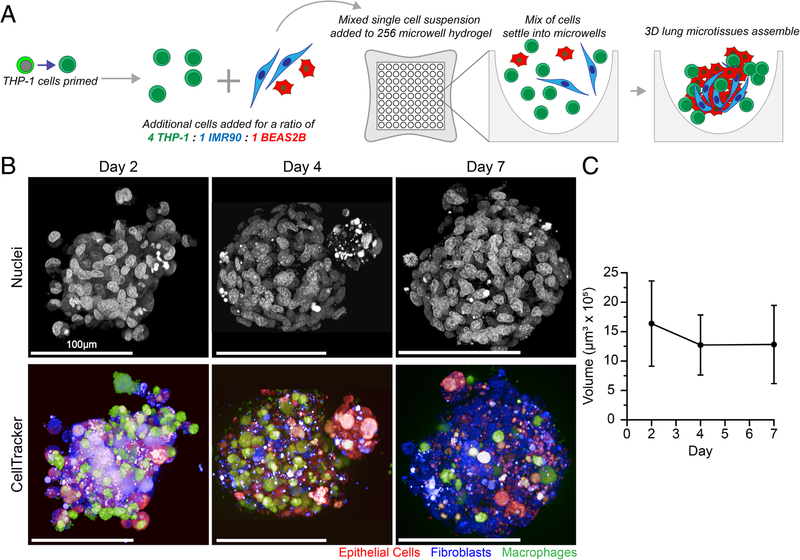 Prior to assembly of this human 3D lung microtissue model, we optimized the dose and exposure time for PMA to obtain stable differentiation, particle phagocytosis, and viability of THP-1 cells (Additional file 1: Figure S1). As recommended by Park et al. , we used a lower dose of PMA, 10 nM for 72 h prior to LPS priming and particle exposure (Fig. 1a). 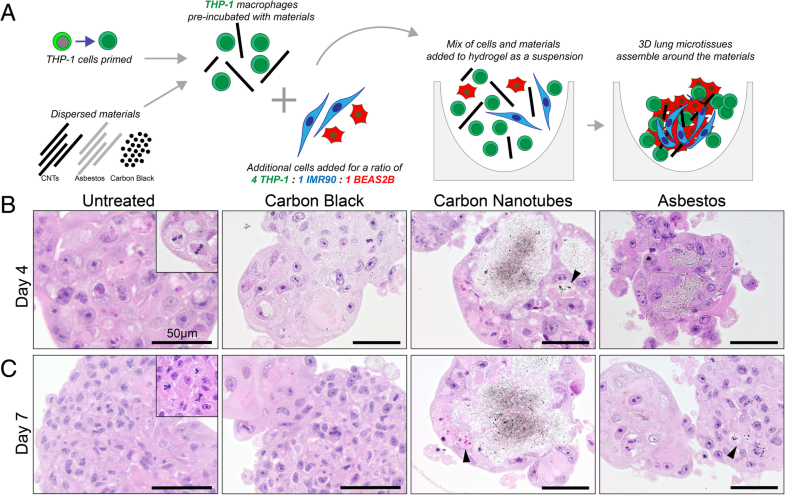 Using this optimized protocol, we confirmed that exposure to high aspect ratio fibrous particles, crocidolite asbestos fibers and carbon nanotubes, but not spherical carbon black particles, caused lysosomal membrane permeabilization and intracellular release of cathepsin B using differentiated THP-1 cells as reported previously [49, 55]. The 3D lung microtissues evaluated in the current study are complex, three-dimensional structures that contain the cell types representative of the epithelial-mesenchymal trophic unit involved in persistent inflammation, lung injury, aberrant repair, and fibrosis [30, 31]. This toxicity testing platform is proposed as a bridging technology between in vitro and in vivo toxicity studies with the goal to reduce animal testing to assess potential toxicity of nanomaterials . Other in vitro lung models have been developed, but have not been used to assess persistent inflammation and cell matrix interactions predictive of pulmonary fibrosis [58–62]. These alternative models include scaffold-free 3D cell culture, acellular lung scaffolds , air-liquid interface models [58–61], and lungs-on-a-chip [64, 65].